President Elect - What If They Tie? This article has been updated every election cycle since 2000. While the probability that Barack Obama and Mitt Romney could tie in the Electoral College vote this year is small, it is by no means impossible. The process to select a President in the event of a tie, as spelled out in the Constitution, is the same as when no candidate receives a majority of electoral votes. Only twice in American history has this situation come up. In the election of 1800, Thomas Jefferson and Aaron Burr both tied with 73 electoral votes. In 1824, Andrew Jackson received 99 votes, John Quincy Adams got 84 votes, and two other candidates took the remaining 78 votes. In both these cases, no candidate received a majority of the total electoral votes cast. With today's two-party system, the most likely way two candidates could fail to receive a majority of votes is to tie 269-269. While some in the media would call this a "constitutional crisis", it is not. The 12th Amendment spells out what should be done when this situation arises. On December 17, 2012, the electors will meet in their state capitals and cast their actual votes. These will be opened and read by the President of the Senate, Joe Biden, in a joint session of the newly elected Congress at 1pm on January 6, 2013. Once it has been established there is a tie, it becomes the responsibility of the 435 members of the House of Representatives to choose the next President of the United States. However, a special voting procedure is employed in this situation. Each state receives only one vote, and the Representatives from each state have to decide which candidate gets theirs. For example, all 36 of Texas' Representatives will vote individually. Then their votes are tallied. 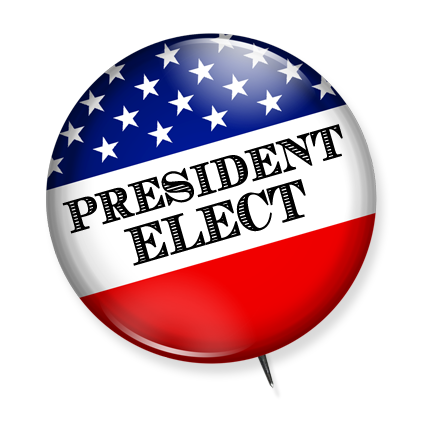 Which ever candidate receives the most votes wins Texas' one vote for President; if the vote is tied, Texas' one vote is not cast. Since electors vote for the president and vice president separately, a tie on the top of the ticket would almost certainly mean a tie on the bottom of the ticket. If Biden and Ryan were both to receive 269 electoral votes each, it would be up to the 100 members of the Senate to choose the winner. The voting procedure here is much more straightforward. As long as at least 67 Senators are present, they each cast one vote. Which ever VP candidate receives at least 51 votes is declared the winner. If the vote is tied at 50-50, there might be a bit of legal haggling over what would happen. Some people assume Biden as the sitting VP would cast the deciding vote. Other people believe that only the Senators themselves would be allowed to vote and that a 50-50 tie would just result in more balloting until someone won. It will be the new Congress that meets to count the votes in 2013. 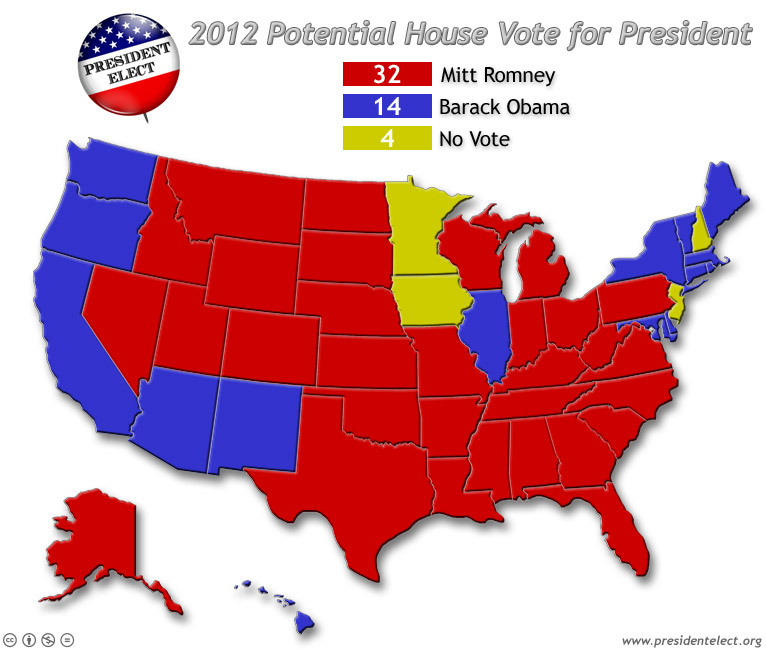 Using current House race predictions from Election Projection, and assuming each Representative votes for the candidate of their party, Mitt Romney would win the House vote 32-14 with 4 states abstaining (see the map below). Using Election Projection's Senate analysis, Joe Biden would become the Vice President 52-47 (with 1 independent whose vote we can't predict) assuming Senators vote along party lines. However, there is a chance other factors besides party loyalty could come in to play. In the House, Representatives might choose to instead vote for the popular vote winner for President. And some Senators might switch sides to allow the winning Presidential candidate to have his chosen running mate. Both possibilities, but probably unlikely.